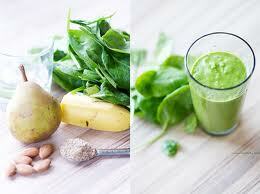 Super smoothies are a great way to get all your daily requirements for Fruit & Vegetables. Rich with essential vitamins, minerals & antioxidants they are full of health benefits like liver detoxification, blood sugar regulation, oxidative stress, bad cholesterol, diabetes and many more. A super smoothie a day keeps the DOCTOR away!!! Another great fact about smoothies are that because you have already broken down the food in the blender it makes it easier to digest as the manual breakdown process has already been done e.g. Chewing & therefore makes the nutrients more Bio Available. You can add a super greens to your smoothie & also a all natural Whey, Soy or Pea Protein powder to make your smoothie complete. My favorite Super Green powder is Synergy Super Greens as it has all four greens; Spirulina, Chlorella, Barley Grass & Wheat Grass. Great for Vegetarians as Iron rich & effective absorption with all the vitamin C.
See below for my Super Breakfast Smoothie & my Super Green Smoothie. 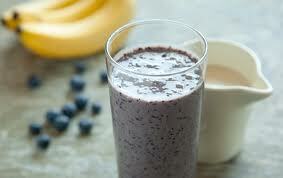 Break up banana into 4 pieces & place into blender with blueberries. Add in Almonds, Goji berries & super greens powder along with almond or oat milk. Add in Chia seeds last as they mix through better this way & won't get stuck to the sides or at the bottom of the blender. Loosely chop up all your parsley & greens. Don't over chop as the heat from chopping can cause your greens to oxidise. Add to the blender. Chop up your green apple, banana, cucumber & lime. Add to blender. Feel the natural energy as all your senses come to life & your bodies vital force is fed with abundance.